Collection of 12 Christmas logo badges and emblems. Each badge is based on vintage engraving illustration which makes it look oldish and unique. 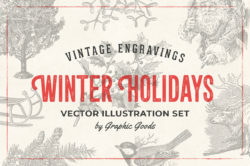 These badges will work perfectly as Christmas cards and any other festive graphics. All elements are vector so you can easily edit it, change the color and scale to any size you need. All text layers are editable. You can find a list of free fonts in PDF file.